Using Southwest Homes to build our house was a great experience. We knew exactly what we wanted when we met with them and they helped put the finishing touches on. Communication during the process couldn't have been better. Scott and his team were amazing during the whole process. We get asked about our house quite often and we tell everyone if they get to a point to where they want to build, then they should definitely go speak to Scott. The Southwest Homes Team was awesome through this whole process. I love my new home and would refer anyone else I know thinking about building a new home. To Southwest Homes, Thanks Again! No words to express how excellent our experience was with this company but to say, "Thank you, Thank you, Thank you!". Everyone was great! Thank you Southwest Homes team, Good Job! Southwest Homes has made this home building experience a pleasant one. The superintendent Brian has got to be the glue that kept our relationship with the construction team/contractors going smoothly. I also had the pleasure of starting my home buying process with Sean. Another great team member of Southwest Homes. Sean made our home selection very easy and his knowledge of all the plans made it become an easy selection. Many thanks to the entire team of Southwest Homes. Each aspect has been exciting; however, I think watching the framing was the most exciting. I could now walk through the rooms and visualize what is to come. I would say this was the moment when the realization that I am actually having a house built really started to sink in... The framing crew that did our home was one heck of a crew! We were so blessed that our home was built to the highest standards. I built with Southwest Homes as a gift to my wife and also a solid, sound investment for our children. We took a direct hit from hurricane Harvey and although our property was wrecked, our home was unscathed. I'll never forget the smile on my wife's face when we returned home to survey the damage! I have no doubt that my Southwest Home will host dinners prepared by my great great grandchildren! Thank you for taking the time to make sure we had a good understanding of the whole process. Thank you for the wonderful and amazing experience! We are raving to our friends and family about your company and personnel. Thank you Sylvie, David and Aaron! Not only are my husband and I happy with our house almost two years after it was built, we are extremely happy with the service-after-the-sale that we have received from Southwest Homes. 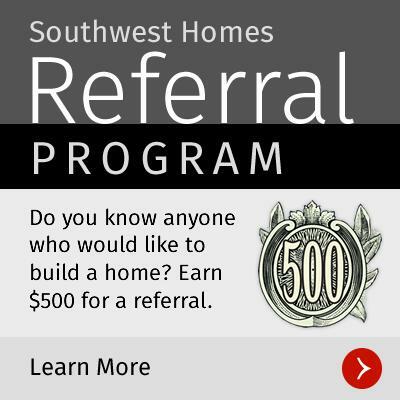 So please share with potential clients and let them know that a wonderful future is ahead for them in their new home built by Southwest Homes! Amazing communication, if we ever had a question and sent an email or text, we received a quick response. My home is more than what I expected. SWHomes personnel always were professional and respectful. Thank you to everyone at SWHomes! I am so glad I let my husband talk me into checking you all out before going with that other company. You guys were great! Everyone at the five points location were absolutely fantastic. They were very professional and made building my first home an awesome experience. They each did a wonderful job. Southwest Homes provided us a home we are happy with, and helped us when no other lender would. The whole staff was wonderful to work with, and did an excellent job from start to finish. All our questions were answered promptly, and every issue was dealt with immediately. I can say we could call everyone at SWH friends! Very good staff to work with. Enjoyed the experience. Awesome experience, Awesome people, Loving the house. Glad we made the choice we did for the builder and house plan. David really went above and beyond. We are very thankful for everything he did. All of the Southwest Homes family were very helpful and understanding for me being a first timer. Excellent job to all of ya'll. Special thanks to Aaron & David. We are so happy with our new home, and excited how everything went so smoothly! Thank you! It was our first time building a house, and it was a great experience. If we ever build again, we will be using you guys again. Thank you for everything. We're happy to be in our home. Overall, from start to finish, the team was amazing. They helped our dream come true! I have told everyone I know we used you guys! Our family has been blessed to have our home built by wonderful people. Thank you Aaron, Sylvie and David for all you did for us. God Bless You. We were pleasantly surprised by the completion time and how easy they made the overall process for us. We are very grateful to the Corpus Christi team for helping us build our first home. Everyone went above and beyond for us and we feel so blessed. Many thanks to Southwest Homes and David for helping us achieve our dreams!! "We had a wonderful experience building our new home & love the quality very much! Our family is very excited & blessed to be in our new Southwest Home. We want to say thank you very much to the Houston Team that we had at Southwest Homes. You all made the experience an enjoyable & great one! Thank you all so much for being such a great an enjoyable team to work with!!!" The Southwest Home team are caring and professional! They make you feel like family!! This is our first house we built from the ground up. The friends I made along the way have been nothing but kind and respectful. I will always remember the experience that SWH has given us. We will forever be grateful. You made our dreams come true. It sure beats renting. Homeownership is a long term investment and a lifestyle choice. Southwest Homes did a great job, we're so grateful and blessed that our house is American Built. The staff was organized and very informative. We felt very comfortable and at ease throughout the whole process, everyone was great. My wife and I wanted to give you some feedback on the construction of our new home. We love our new home and believe we received excellent quality for a fair price. We especially wanted you to know our relationship with Scott during the complete process. We immediately liked Scott from the beginning. We had visited one of your competitors before contacting SWH. They were more interested in trying to tell us what we need, not what we wanted. Scott was interested in what we wanted. He worked very hard to get us a design that we wanted. •	Always prompt and professional in dealing with any issues. •	Strived to give us a quality product. •	During any of our anxiety, Scott was "Cool Hand Luke", he always resolved the situation. •	We consider Scott to be part of our extended family. Scott is a wonderful asset to your company. We know under his leadership that you will continue to have a highly successful business. SWH Team did excellent from start to finish! Took a lot of stress off us. Thank You All!! From the first time we meet with SWHs we felt at ease and building with them. Once the building process started everything went smooth all the way through till our new home was completed and our closing. It was a good experience and my thanks to the Corpus Christi Team! They helped me out a lot. Todd went above and beyond during this entire building process. We have not had any negative workers at our place. Everyone has been extremely nice and helpful. If we ever had to do this over, we would be using SWH and Todd!! Clint and Sylvie made our dream home possible. Our experience with SWH was stress free and felt at ease throughout the process. Thank you Clint, Sylvie and SWH.